Value creation is a term that gets lots of lip service. But I've found that very few people actually understand what value creation really is and what it really means. Our definition of value creation is you are creating value when you are doing something that someone would be willing to pay more for. Here's how you know you're creating value in your sales and marketing process - would someone pay for a sales call? Would someone pay to get access to your marketing materials or to see your advertising? Would someone pay to hear what you have to say? (Not necessarily would they buy it, but would they pay to hear what you have to say.) Additionally, when you take a look at your ultimate offering, you're creating value when people are willing to pay more than they are for other alternatives. How do you create value? Well, you create value by solving problems. But, solving problems is not necessarily enough to actually be in the value creation mode. Let's take a look at the universe of problems that we have. The big circle represents the universe of problems. What we find is that 95 percent of companies out there focus their marketing, their messaging and their efforts at the center, at the white space here in our problem universe. They focus on solving problems that customers already know and already understand. We call that demand fulfillment. When you're solving problems that customers are already aware of and customers already understand, you're providing a commodity product or service. Now, this is somewhat antithetical to traditional business because when I went to school and got my marketing degree, they taught me that my job as a marketer was to find an existing need, and then to address that need. In essence, my job was to fulfill demand. In the 1960s, 1970s and 1980s, that was enough. Today, because of commoditization, if all you're doing is solving problems the customers already know and already understand, you're not creating value. 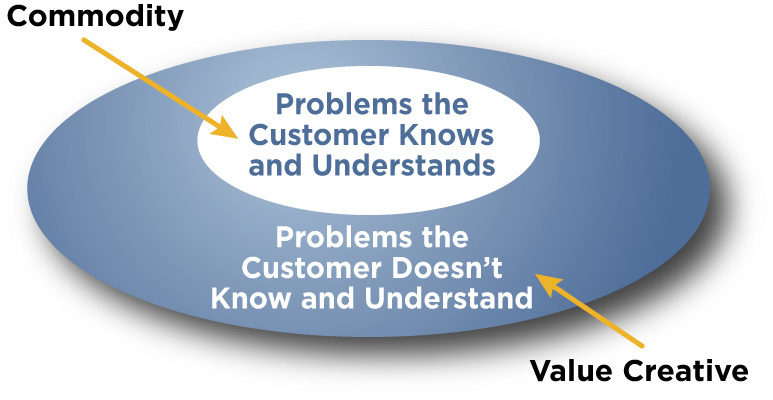 All value creation occurs when you solve problems that customers don't already know about or at least don't fully understand. When you do that, you're in the position to create demand.